Great post and ideas. Target is excellent for getting decor items for your home. Don’t stress if your home is not completely furnished after you close. Take your time and enjoy new ownership. Continue to pick up items bit by bit and have fun!! LOVE the shimmery pillows <3 and we got those wood bowls for our wedding. So thought Id use them more, but they are cute. 😀 love this post. I never really shopped at Target before, but after reading this post, I will definitely check it out! Their style seems pretty modern. Thanks for the information! Target has great stuff in-store but their online shop is amazing! They partner with other retailers and have a huge selection and high quality goods available only online. Just remember to order with your Red Carr and it’s always free shipping! 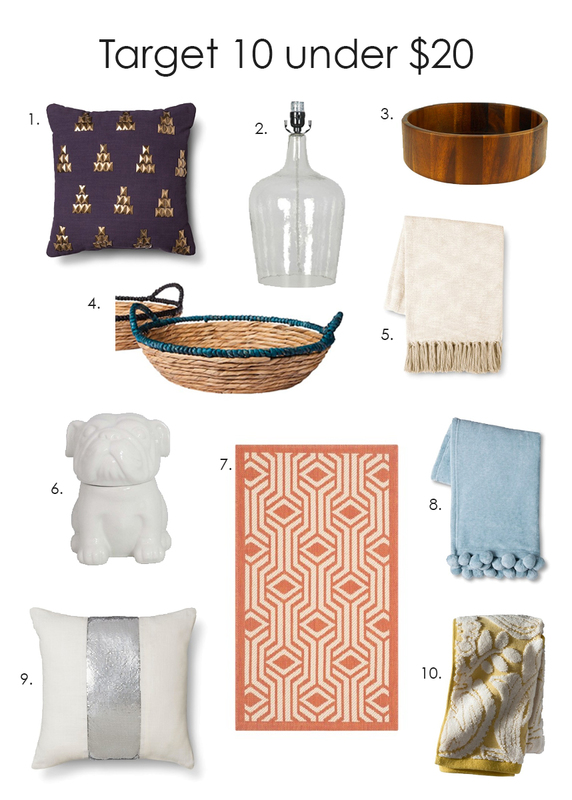 I’m all for affordable and fashionable decor, and these pieces don’t disappoint! I’m in love with the color and print of that rug! I’m glad you like them! I always forget that their site has a million and a half more options than the store and usually I can find something I need if I take the time to get online. This makes me wanna go to Target like right now haha. I actually have those yellow towels! Do you love those towels? I’m thinking about them for our new guest bath! I love all these finds, and your style. Im definitely going to check it out! specially that orange rug!! Thanks for this affordable post! I found your blog b/c you commented on hisugarplum. Of course I love Target and sadly am on a first name basis with most of the workers at our local store. I can’t believe some of the decor items are so cheap. Especially the pillows. Thanks for the informative post. Jennifer, thanks for stopping by! We have posts M-F and I’d love for you to stop by again! We’ll be doing some awesome giveaways soon too! I love the baskets! Your color choices are bright and work well with each other.